In a couple of minutes they either quit or we left the city. It was the same way on the return trip. And for the next two times I traveled there. My driver spoke so little Engirisu I didn’t even know how to ask. So when I got back I asked Gerry Sullivan, a civilian lawyer in our office who had been there since the Occupation. He knew everything. He said that in the war, after we’d begun sending in waves of B-29’s to blast all their industrial areas, of course, a few were shot down. It seems a couple of those crews went down in Hachioji, and were paraded through the city, much like the Somalis did our Blackhawk crew, only the B-29 crews were still alive. The captured American airmen were beheaded with samurai swords in some public place, and filmed, and it so impressed the bosses at the war ministry in Tokyo they turned the film into a propaganda film, and spread it throughout the Empire, showing that they were beating back the barbarian Americans. Bad idea, for when American pilots saw the published photos of the executions, they adopted the motto, “Save one for Hachioji”, meaning hold back one bomb from their assigned bombing runs and drop it on Hachioji. Thousands of bombs saved for a target with no military value at all. 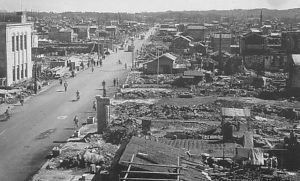 The destruction was so extensive that, for decades after the war, American military personnel were warned not to visit Hachioji, because of the residual hostility to Americans. Still, we had to drive through to get to our air base. I was there 30 years after the war, and found the Japanese people, except when traveling as a tour group anywhere in the world, to be the most polite and easy-to-talk people on earth. And now, 40 years further down the road, Japan, not Germany, has turned out to be America’s greatest success story at nation-rebuilding. I wonder if that includes Hachioji? Now that’s interesting. Can’t explain it. Stationed at NAS Atsugi Oct ’65 to Oct ’67, and we were informed during the week-long orientation, and at the end, I was designated to become a driver (a one week course) when my Air Traffic Control duties did not interfere. Most of the trips were completed in the local area. I had a few trips to Tokyo Airport and Yokosuka. I believe we made about four trips requiring transient through Hachioji without incident. It was a modern city, and we see where they hanged the airman. Now I heard that at one time they either hung or shot a crew of seven??? Thanks for filling in some blanks. I was there ’72-’75 and the only thing UI can figure, in hindsight, could have been the heightened political fever over that period of the Vietnam War…the “Paris Talks”. There were snake-dances everywhere.